A “16 percent ghetto.” That’s the term that Debora Spar, president of Barnard College, recently coined for the low representation of American women in positions of power. Although she identified this phenomenon in aerospace, engineering, Hollywood film, higher education and Fortune 500 companies, she notably did not include medicine. One might expect the situation to be better in a field where women now comprise 50 percent or more of most medical school classes across the country. Unfortunately, my review of the latest statistics for women physicians confirmed Dr. Spar’s observation: Studies of women in academic medicine uniformly show that, although female physicians represent about 27 percent of physicians in medical teaching, and 22 percent in research, disparities persist in our advancement. Only 16 percent of medical school faculty at the full professor rank are female. Women medical deans fare less well: out of 137 deans of US medical schools today, 13 (10 percent) are women. In hospital management, the discrimination is compounded by the fact that doctors comprise a minority of leaders. In 2009, only 235 (fewer than 4 percent) of 6500 hospitals in the US were headed by physicians of either gender. lthough there are no published data regarding leadership roles for women physicians in the pharmaceutical or biotechnology industries, women in general hold no more than 17 percent of senior management roles. In the past, the commonly cited reason for why so few of us have risen to the top, apart from sexism, has been that women choose not to be leaders; We lack interest and/or skill in leadership; We choose to devote our time to families rather than concentrating our attention on professional advancement. This rationale has been debunked in recent years by well-regarded scholars on gender and leadership. It turns out that many women do enjoy management roles and we make excellent leaders. Moreover, at least one 15 year study of 1500 US companies found that firms with women at the top performed significantly better. Success was attributed to a so-called democratic “female management style” which fosters creativity, teamwork, and the desire to solve problems (1). Organizational psychologists have labeled this type of leadership approach “transformational” as opposed to “transactional” in that the transformational leader is said to be more concerned with forward-thinking ideas than process (2). But at this pivotal point in history, when reform of the healthcare delivery system in the US is inevitable, the country needs physician leaders who can encourage their followers to think “outside the box”, to help redefine the mission, vision, and values of medicine in order to increase quality of care while keeping costs down appropriately. Given that women are as likely (if not more likely) than men to be transformational leaders, talented women physician executives articulate in the language of health policy and business, should be among those leading the way. Men still dominate senior management positions in healthcare. For women to progress beyond our current “16 percent ghetto”, organizations have to make conscious changes, including encouraging mentorship of female physicians early in their careers, eliminating double standards that penalize us for traits rewarded in men such as assertiveness, and removing work-family barriers for both genders. Deborah Shlian is the editor of “Lessons Learned: Stories from Women in Medical Management,” which has received very favorable reviews including one from Forbes magazine. 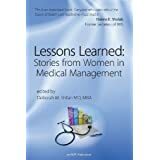 Lessons Learned: Stories from Women in Medical Management is available in paperback and on Kindle®. This entry was posted on April 7, 2013 by Deborah Shlian in 2013, Business, Health Care, Jobs, Living, Women, Years and tagged Healthcare, Leadership, women leaders.